If you operate within the medical, environmental, laboratory or print industries then you will know firsthand how important the right filtration product is to the outcome of your work. Here at Filter Devices (part of the CliniMed® Group) we are have more than 30 year experience in the design and manufacture of high quality filtration products and each product is manufactured to ISO13485:2003 standards. We know no two companies’ demands are the same and therefore offer a range of different services and options, which include: access to an in-house Filter Specialist for help and guidance, try before you buy sampling, a comprehensive range of testing and validation services, options for logo printing and a choice of filters that are ETO sterilised or non-sterile. Please contact the team at Filter Devices for further information and advice regarding our complete range of services. We also supply a fantastic range of high-quality, SteriClean products. This range has been designed to provide users with all the alcohols, biocides and neutral detergents needed for cleaning and disinfecting cabinets and surfaces in controlled environments. Our range includes: Alcohol Sprays, Biocide and Detergent Sprays, Cleaning Validation Kits, Hand Sanitising Gels, Impregnated Wipes, Pharmacy Dry Wipes, Polywipes, Swabs and Tissue Sheets. Please visit our website to view images and further information. Or alternatively, contact us at Helapet with enquiries or to place your orders. Do you regularly carry out procedures in critically controlled environments? If so, the Berner Nitrile glove will protect you against the hazards associated with viruses, cyotoxics, viruses and chemotherapy drugs. It’s made from a distinctive nitrile combination of non-latex materials which adheres to ASTM and EN-374 standards, and is appropriate for use in environments as high as Class 100. Giving maximum grip and ease of manipulation, the glove has a 300-mm cuff which adds greater cover to the wrist, while the textured finger tips make handling items even safer. You can choose from a range of sizes and between sterile and non-sterile options. Reduce the risk of needle-stick injuries with the help of the NeedleSafe II re-sheathing block. It’ll enable you to safely uncap and re-sheathe needles with just one hand when you’re in potentially risky clean-room and clinical situations. The NeedleSafe II is based around a universal gripper core and makes exposing your hands unnecessary. You can detach its base and mount it either vertically or horizontally. Sterilise the device by autoclaving or alcohol disinfection when you need it in a controlled environment, while separating the assembly from the base is simple when cleaning is required. Get in touch if you’d like a free demonstration of the product! Workers on the front-line who have to comply with the ’30-minute rule’ when reissuing red blood cells will welcome the Blood Temp 10 temperature breach indicator. By just pushing a button, you’ll be able to monitor temperatures inside individual blood bags, with the indicator window’s colour altering in event of breaches occurring above +10°C. Consequently, you can make informed decisions about whether to give out blood bags again even once they’ve been taken out of controlled storage. No pre-conditioning is needed to use this all-inclusive and self-contained product, which can be attached to every type of blood bag with the help of adhesive backing. The Vari-Disk® filter solution allows a variety of businesses, including those in the medical, laboratory and printing industries, to create a bespoke filter device. By offering an extensive choice of connectors, including barb type, luer type and both ⅛” and ¼” male national pipe thread, you are assured of a secure fit. With housings manufactured in virgin Borealis polypropylene (USP Class6), Vari-Disk® filters are available in either 25mm or 50mm options and we can also arrange for them to be printed with your logo, if required. To help you select the best combination for your needs we have a dedicated Filtration Specialist on hand to provide you with expert guidance. Our 50mm, hydrophobic sterile rated Autoclave filters have been manufactured using 0.3µm HEPA media and we are also able to manufacture autoclave filters with 0.2 µm PTFE media on request. Their bi-direction flow capabilities allow air to move in or out of the autoclave and they been designed for the filtration of either gas or air. We offer three different styles of connector to suit different applications: ¼” stepped barb, 3/16” barb and 1/8” BSPT/cut flush, all of which are sold in packs of 20 pieces. Please contact us to discuss our range of testing options that can be carried out if required. Our VacuDisk® filters provide a robust solution for vacuum suction devices and have been designed and thoroughly tested to ensure they are able to tolerate pressures of up to 50psi. Fabricated from Borealis polypropylene and 0.45µm PTFE media, these filters provide excellent particle retention. The filter media’s microporous membranes are also hydrophobic enabling excellent resistance to moisture found in gases and air. All VacuDisk® filters feature a ¼” hose barb connector. A number of different testing options are available, including bubble point, clean pressure drop, water-entry-pressure, flow rate and burst integrity testing, so please contact us to find out more. Equipment such as gas analysers and pneumatics are extremely sensitive to particulate matter and moisture in the air and as a result readings can be adversely affected by their presence. The use of a filter prevents this from happening as it stops particles from entering the analyser and the higher the performance of the membrane used, the better the performance of the device. Filter Device’s gas analyser filters feature 1.0μm PFTE media as standard but we are also able to supply 0.3μm HEPA media if required and have been constructed to withstand pressures of up to 80psi. The use of filters in ink-jet-printers is not only imperative to achieving even ink distribution and high print quality, but they are also required to provide a protective barrier between the printer mechanisms and particulate matter. Our ink jet filters can be fitted with Jaco, NPT or FLL connectors and have undergone testing to ensure they are able to withstand pressures of up to 50psi. We have an excellent choice of microns available, in both our 25mm and 50mm filters, so you can choose an option that is suitable for the environment in which they will be used. At Filter Devices we have a comprehensive range of pipette control filters fabricated from a choice of 0.2μm or 0.45μm PFTE media, with the main housing manufactured in sturdy FDA approved USP class 6 Borealis polypropylene. Constructed in a universal size to ensure a precise fit in any pipette controller, these filters allow only sterile air to enter the pipette and inhibit pollutants from infiltrating the liquid that is being transferred. Available in packs of 50 pieces, these filters feature inlet and outlet Male Slip Luers as standard. If you've any questions about Filter Devices products or services feel free to ask them here. Berner Helapet is the leading UK distributor for these versatile gloves, supplying them directly to customers both as gloves and undergloves. Helapet Porter Ideal solutions to the cold chain industry where transport is required to keep products at the right temperature. Porters are supplied in a variety of sizes along with validations. PharmaPack A recommended choice for syringes and venting/non-venting caps, providing security and reliability. RoweMed Specialists in the development and production of innovative products for the medical industry. 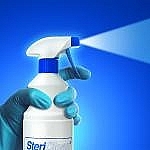 SteriClean A full rotational cleaning regime designed to aid cleaning and disinfection within critical areas. Full validation avaliable upon request. Timestrip UK TimestripPlus™ is a new cost-effective, single-use way to manage the condition of temperature-sensitive drugs and products dispensed from hospital pharmacy. Temperature-sensitive drugs need to be stored correctly throughout their time in stores, pharmacy, and right up to their eventual use. Poor temperature control can lead to compromised product, which could adversely affect patient care. TrimstripPlus™ helps you manage temperature-sensitive products by providing a visual aid that indicates when a product has passed a specific temperature. Varidisk Varidisk filters offer excellent sterile venting solutions for carboys, filling vessels and fermentation tanks. VisioMed Specialists in the development, creation and the manufacture of innovative healthcare medical devices sold within the pharmaceutical network. West Pharmaceutical Services Renowned brand for medical solution transfer devices in hospitals and healthcare environments.